Ariel, Eric and Melody Cosplay. The Little Mermaid 2. 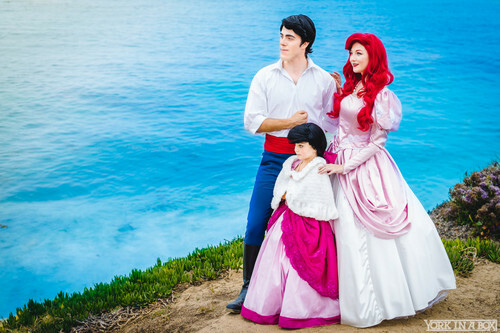 HD Wallpaper and background images in the ディズニープリンセス club tagged: photo the little mermaid 2 cosplay ariel eric melody disney 2000 animated film. This ディズニープリンセス photo contains 名誉の花嫁介添人, メイド, 花嫁介添人, メイドの名誉, and 名誉のメイド. There might also be ブーケ, コサージュ, 花束, 小さな花束, ポーズ, ノーズゲイ, ガウン, ガウン, and ローブ.